Onions are one of the most popular vegetables in the world. They come in all shapes, sizes, and colors. Some are strong and some are sweet. Sweet onions are usually large in size and round with a mild sweet flavor. Their mildness comes from their low sulfur content and high water content when compared to other onion varieties. Other varieties are known as "storage onions" because they can be stored longer. They are low in water content, more pungent, and they are usually cooked before eating. This category includes the yellow onion, white onion, red onion, Spanish onion, and Bermuda onion. Because sweet onions have a low sulfur content, they are not only milder and sweeter, but they cause less or no tears when they are cut. So now you know that "not all onions are created equal". Here in Hawaii we are blessed to have sweet Maui onions, they are so sweet you can eat them like an apple. 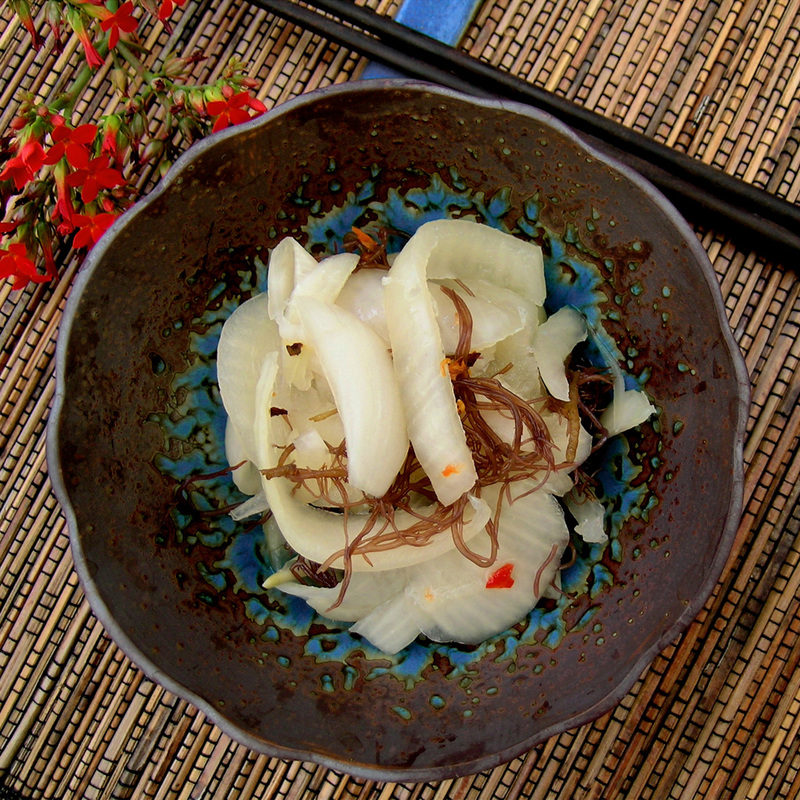 Sweet onions originally came from the Canary Islands, principally Teneriffe Island. In 1898, seeds from that island were planted in the city of Cotulla, in South Texas. The sweet onion crop was an huge success. Today these sweet onions are Texas' leading vegetable crop. There are many varieties of sweet onions including Vidalia, Walla Walla, Sweet Imperial, Texas Spring Sweet, Texas 1015Y, Carzalia Sweet, Oso Sweet, Arizona, Granex, and our wonderful Maui sweet onion. You may have noticed that many of these sweet onions are named after the locations in which they're grown. I absolutely love pickled Maui onions. They are a great thing to have on hand to serve alongside fish, hamburgers, or whatever. Peel, halve and slice the onions into bite size pieces. Add all ingredients except the onions into a stockpot (one that is non-reactive). Place the stockpot on the stovetop on high heat. Stir well with a wooden spoon to dissolve the sugar into the vinegar while it comes up the boil. Once the pickling liquid is boiling, add the onions. Stir the onions and allow the temperature to come back to a simmer. Once simmering, cook the onions for a further 20 seconds and then remove from the heat. Allow the onions to cool slightly before transferring them into glass jars. Once you have tightly packed in the onions pour enough pickling liquid over to cover them completely. Makes 3 cups. Note: If you like a spicier pickled onion, you can add red pepper flakes into the pickling liquid. If you can't get Maui onions, use red onions, which will turn your onions pink. Pink is not one of my favorite colors. A lot of Hawaiians also add "ogo" to their pickled onions. Ogo is a brownish seaweed that grows within the reef here on Moloka'i, and adds a nice crisp texture. Bring vinegar, water, salt and sugar to a boil. Pour over onions (carrots and green pepper, if added). Use gallon container (glass) let cool. Refrigerate 1 month before eating. Serve this beautiful slaw on grilled fish tacos, or on the side with a hamburger. In a medium bowl, whisk 1 tablespoon of vegetable oil and 1/2 teaspoon of soy sauce with the lime juice and mirin. Season with salt and pepper. Add the carrots, cucumber, radish sprouts and onion and toss to combine. Makes 4 servings. If you have never tried hearts of palm, you should. This is wonderful combination of flavors and textures for a delicious light lunch, or a side salad. In large bowl, toss tomatoes with onions, hearts of palm, parsley, lime juice, salt, and pepper. Makes 8 servings. This tangy-sweet relish pairs nicely with pork tenderloins, or serve it as an appetizer atop toasted baguette slices. Heat butter over medium heat in medium heavy saucepan. Add onion and cook for 5 minutes, stirring often. Sprinkle with sugar and continue slowly cooking (you may need to turn heat down if onions begin to brown too quickly or burn) until onions are very soft and browned — 8 to 10 minutes. Add vinegar, wine, raisins and simmer until almost all of the liquids have evaporated and the onion mixture is glistening and syrupy — about 5 minutes. Makes 2/3 cup. Who doesn't love fried onion rings, but made with sweet Maui Kula onions and crispy panko takes this recipe over the top. Combine flour, cornstarch and salt and pepper to taste in large bowl. Whisk in ale until smooth. Cut onions into 1/4- to 1/3-inch-thick slices. Heat oil in deep fryer to 400F. Coat onion rings with batter, then sprinkle with panko. Gently add to hot oil without crowding pan and cook until golden brown. Remove with slotted spoon and drain on paper towels. Season with salt while onions are hot. Makes 4 servings. This is one of my favorite classic soups, a rich addition to start your next dinner party whether you live on Maui or the French Riviera. Heat olive oil in a Dutch oven over medium-high heat. Add onions to pan; sauté for 5 minutes or until tender. Stir in sugar, pepper, and 1/4 teaspoon salt. Reduce heat to medium; cook 20 minutes, stirring frequently. Increase heat to medium-high, and sauté for 5 minutes or until onion is golden brown. Stir in wine, and cook for 1 minute. Add broth and thyme; bring to a boil. Cover, reduce heat, and simmer 2 hours. Preheat broiler. Place bread in a single layer on a baking sheet; broil 2 minutes or until toasted, turning after 1 minute. Place 8 ovenproof bowls on a jelly-roll pan. Ladle 1 cup soup into each bowl. Divide bread evenly among bowls; top each serving with 1 cheese slice. Broil 3 minutes or until cheese begins to brown. Makes 8 servings. This is a thin pizza recipe because it uses large flour tortillas instead of pizza dough. My wife and I have flour tortilla pizzas all the time, once you have tried it you will love it. Place racks in the upper and lower thirds of the oven. Preheat the oven to 450°F. Heat 1 tablespoon olive oil in a small sauté pan on medium hight heat. Add the sliced Maui onions and cook, stirring occasionally, until the onions begin to soften. Add a pinch of sugar and the balsamic vinegar, cook for a few more minutes until the onions are thoroughly softened and translucent. Remove from heat. Line two rimmed baking sheets with parchment paper and brush with olive oil. Place a tortilla on each baking sheet and lightly brush each with olive oil. Sprinkle each tortilla with half a cup of shredded Asiago cheese. Add bits of ricotta cheese, 1/3 cup for each tortilla. Sprinkle with mushrooms and with the slightly caramelized onions. Sprinkle with a little salt and pepper. Place the baking sheets in the oven. Bake until the crust is crisp and brown all over (the time varies, depending on the oven and if your cookie sheet has already been heated, start with 10 minutes and check), rotating the sheets to ensure even baking. Cut with a pizza cutter or a knife. Makes 1-2 servings. This is an awesome combination of flavors that will bring you back for more. Light a grill. In a mini food processor, pulse the pitted olives with the crushed garlic and oregano until chopped. Add the 1/4 cup plus 2 tablespoons of olive oil and pulse until finely chopped. Season with pepper. Brush the tomatoes, onion and cut sides of the rolls with olive oil. Grill the tomatoes and onion over high heat until they are softened and lightly charred, about 2 minutes for the tomatoes and 6 minutes for the onion. Transfer to a plate and season with salt and pepper. Grill the bread until lightly toasted, about 2 minutes. Season the chicken thighs with salt and pepper and grill them over high heat, turning occasionally, until they are lightly browned in spots and cooked through, 5 to 6 minutes. Cut the chicken to fit the toasted rolls and top with the sliced tomatoes, sliced onion and olive relish. Close the sandwiches, cut them in half and serve right away. Makes 4 servings. Creamy sweet Maui onions surrounded by cheese with a crispy panko top, a wonderful side dish. Preheat the oven to 375˚F. Lightly grease a gratin dish or medium casserole. Cut off the root and tip of the onions. Slice in half length-wise andpeel. Lay the cut-side of the onion down and slice length-wise into thick wedges. In a Dutch oven or heavy pot, melt two tablespoons of butter over medium heat. Add the onions and cook, stirring occasionally, until soft and caramelized, about 40 minutes. Add the sherry andsimmer until it evaporates. Remove the onions from the pan and pour through a fine mesh sieve. Let them drain while making the bechamel sauce. (Draining the onions prevents a runny gratinbecause the onions will continue to release more liquid in the oven.) In the same Dutch oven, melt 3 tablespoons of butter over medium heat. Stir in the flour and cook for one minute. Add the scalded milk and cook, whisking constantly, until the sauce is very thick. Remove from the heat. Fold in the Gruyere and stir until completely melted. Season with salt and pepper, to taste. Add the onions to the cheese sauce and toss to thoroughly coat. Pour the onion mixture into the gratin dish. Melt the remaining tablespoon of butter and toss with the panko crumbs. Sprinkle over the top of the onions and bake until bubbly and golden brown, about 30 minutes. Serve warm. Makes 6-8 servings. This sounds like a dessert but it isn't. Serve this delicious tomato-onion crumble pie as a side dish, and your guests will know you can cook. Heat oil in a 10- to 12-inch frying pan over medium heat. When hot, add onions and garlic. Stir frequently until onions are limp and beginning to brown, about 6 minutes. Pour into a 2- to 3-quart baking dish with sides at least 2 inches high, and spread onions level. Top evenly with tomato slices, basil, and oregano. Sprinkle generously with salt and pepper. In a food processor, whirl bread with butter and cheese until mixture forms coarse crumbs. Sprinkle evenly over tomatoes. Bake in a 350°F oven until topping is golden brown and juices are bubbling, 20 to 25 minutes. Cool 5 minutes and serve warm. Makes 8-10 servings. This savory dish is perfect as a side dish with prime rib, chicken, or pork. Stir together first 3 ingredients in a large bowl, blending well. Combine flour and next 3 ingredients; gradually stir into egg mixture. Set aside. Melt butter in a large skillet over medium heat; add onions. Cook, stirring often, 30 to 40 minutes or until caramel colored. Remove from heat. Stir onions into egg mixture; then spoon into a lightly greased 13- x 9-inch baking dish. Bake at 350° for 30 minutes or until pudding is set. Makes 8 servings.